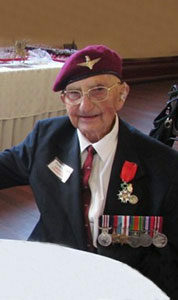 Francis ‘Frank’ James Hall served in The 1st King’s Dragoon Guards, Royal Armoured Corps, prior to volunteering for service with The Parachute Regiment during World War II. Initially posted to Holding Company, Frank was later assigned to 1 Platoon, A Company, 12th Parachute Battalion which formed part of 5th Parachute Brigade within the 6th Airborne Division. He made a combat jump into Normandy on the night of 5/6 June 1944 as part of the spearhead force which was sent in advance of the main seaborne landings. The Normandy Landings marked the start of the liberation of north west Europe from German occupation. The battalion quickly secured the village of Ranville. The following day elements of the battalion including A Company were counter attacked by German forces as they held defensive positions south of Ranville to protect the bridgehead. Frank was later awarded the Military Medal for his gallantry during this counter attack. Frank continued to serve with the battalion and was eventually promoted to Sergeant. He emigrated to Australia following demobilisation from the British Army, and served in The Royal Australian Armoured Corps from 1951 to 1957. Frank was awarded the Legion de Honneur on Wednesday 10 June 2015, by the French Ambassador in Perth, Western Australia. He got his Military Medal (M.M) from King George VI at Buckingham Palace for his action in Normandy.